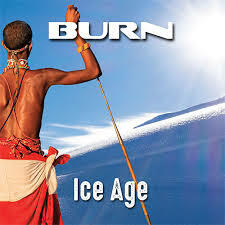 British rockers Burn have certainly trodden a troubled path on the way to 'Ice Age', their fourth album in 25 years. Founding members Marc and Barney Stackhouse have kept the fire burning over the years on and off, resurrecting the band in 2007 for the very highly rated 'Global Warning' album, but even a triumphant appearence at Firefest in 2008 didn't end up being the glue that kept the band together for good. As we all know, though, you can't keep good musicians down, and Burn are back once more with a new secret weapon or two in their armoury. So what do you do if you want a lead singer who can handle the material, has a ridiculous amount of experience and a built in fan base? Simple - you call Steve Newman. As you should be well aware, Newman in a bit of a veteran at this melodic rock thing, and apparently was very happy to be part of a band without his name on it, especially one with the quality of songs Burn were offering. The other secret weapon is guitarist Chris Green (Furyon, Tyketto and more), who brings a very high standard with the benefit of being used to botgh AOR and metal. What could go wrong? the simple answer is 'nothing'. Seriously, there is nothing at all wrong with 'Ice Age', which really grinds my gears as I can't take the piss. Okay, so it's got a wanky intro at the beginning, but that's just a personal annoyance and I can always skip it. As for the rest, the only accurate thing to say is 'wow'. Straight away things get chunky and melodic with 'Irontown', a song that I guarantee you'll be singing along with during the first listen. As it's the lead track you can go listen to it now on YouTube, and trust me it's a VERY hard song to dislike. One thing that's apparent is Steve Newman is really on fine voice here, raising his register slightly at times to fit in perfectly with the songs. The songs themselves, meanwhile, are some of the best I've heard for a while now. The songwriting is a real band effort, with guitarist Phil Hammond collaborating with Barney, Chris and Steve on most of the songs, and they seem like they've been hammered into shape by people who really care about what they're doing and won't let a song out of it's cage until it's ready. BONFIRE - "TEMPLE OF LIES"
CRAZY CULT ROADSHOW: "Crazy Cult Roadshow"